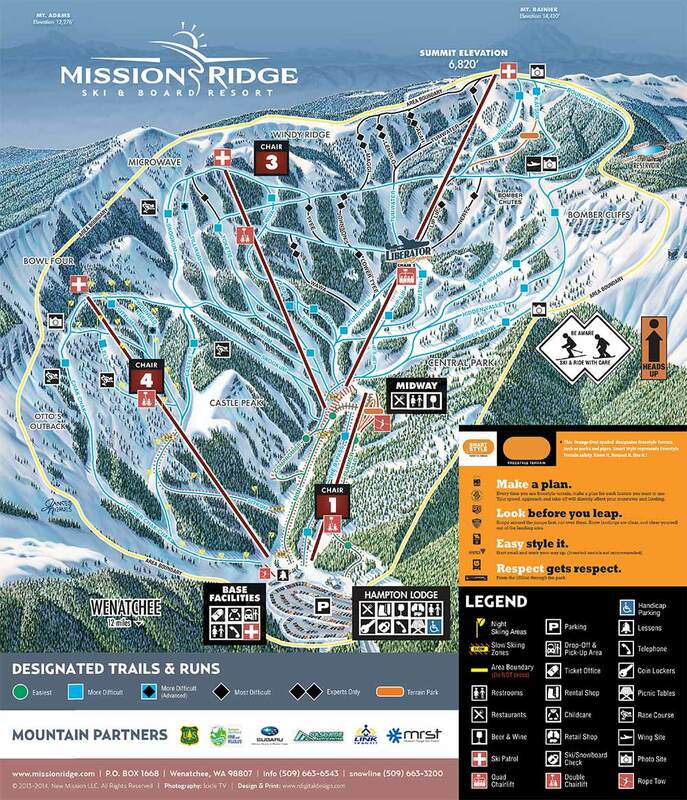 Today’s Mission Ridge encompasses 2,000 acres with a 2,250′ vertical drop. Improvements include additional parking, a new lodge and base area, expanded beginner terrain, a Windy Ridge lift and upgrades of current lifts. 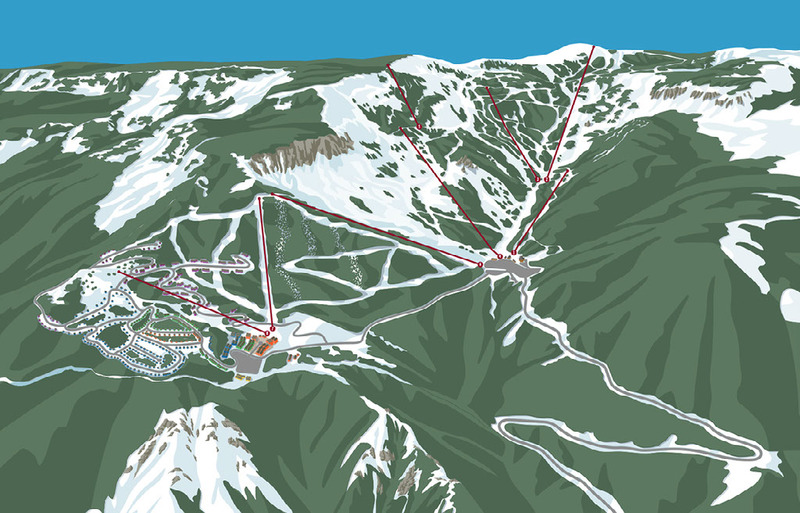 Mr. Scrivanich bought nearly 800 acres of private land near the resort in 2014, part of which will be used for new skiing and real estate development. In order for the plan to work, 155 acres of public land will need to be added to Mission Ridge’s special use permit. This parcel would include Chair 6, a connector fixed-grip double and a new road to link the two base areas. Some 500 acres of private land could be developed over 20-plus years with up to 870 residential and commercial units. A new Chair 7 would be another fixed-grip double and Chair 8 a beginner fixed quad. More specifics are at MissionRidge.com/expansion. 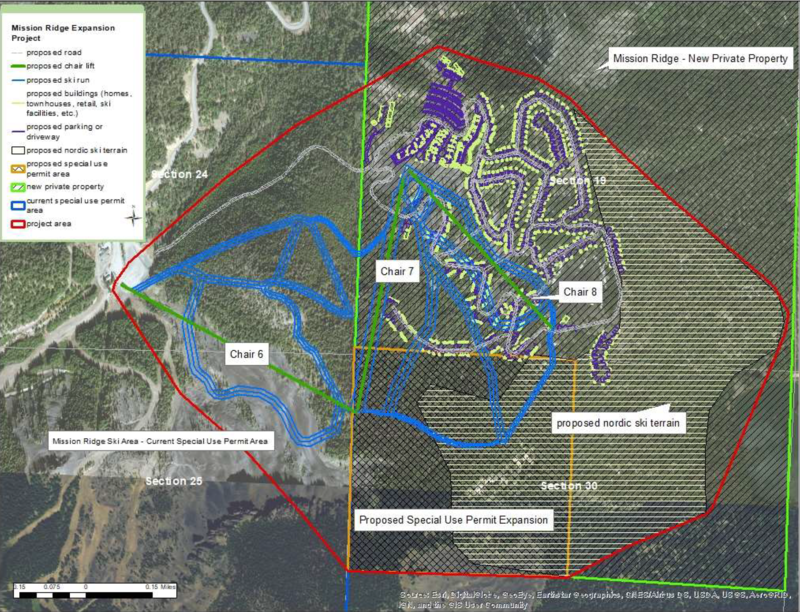 “Currently, Mission Ridge has limitations that have impeded the ability to provide a full range of services and has put sustainability of the ski area at risk,” the plan notes. Commercial and residential development could raise capital needed to improve the ski experience. “We’ve got chairlifts out there that are five decades old,” Jorgensen told the Wenatchee paper in 2016. “Every season, we keep them running and, for right now, that works. But we can’t do that forever. The Village is an opportunity to transform the resort.” As a Washington native, I always found it remarkable that despite incredible skiing, no destination resort ever developed in the Evergreen State. The aforementioned Crystal Mountain and Stevens Pass – plus Mt. Baker, Snoqualmie and White Pass and – are today surrounded by large swaths of public lands that will never see major villages. But with hundreds of acres of private land so close to its already fantastic terrain, Mission Ridge could finally be the one to bring a ski resort experience to the Cascades. What’s the story on Chair 5? I see it on the master plan, but no mention otherwise. As I understand it, the Windy Ridge lift and any upgrades to the four existing lifts will be submitted to the Forest Service separately. The current Environmental Assessment is narrowly focused on the land needed for the village and related lifts. Looks like it would serve the really steep stuff. The expansion? Not quite. All beginner/low intermediate terrain. The Windy Ridge lift looks like it would be fun though. Sorry, I meant that to be a reply to the chair 5 question. Good to see Mission Ridge being aggressive. Only been there twice but loved the vibe. Probably a lot more than they love sitting between Vail and Alterra. I think they need to replace all of their current lifts. Is that in the plan? No. Read Peter’s comment above. Nothing wrong with Riblets, people.